At the pleasure of the police. Let’s take this apart line by line. Then at that point the police have no further interest seeing as their job is to enforce laws. My standard line is to never volunteer anything to police. If you’re in their crosshairs then demand to know if you’re being arrested and on what charge. If they can’t do that then they have no business with you. … but the victim, or anyone else, believes it was motivated by prejudice or hate, we would class this as a ‘hate incident’. So much in this line. To believe is subjective. It is not based on facts but on feelings. It is bad enough that for the past 30 years Western governments have increasingly sought to legislate based on feelings, but now it seems that the police want to arrest people based on feelings as well. 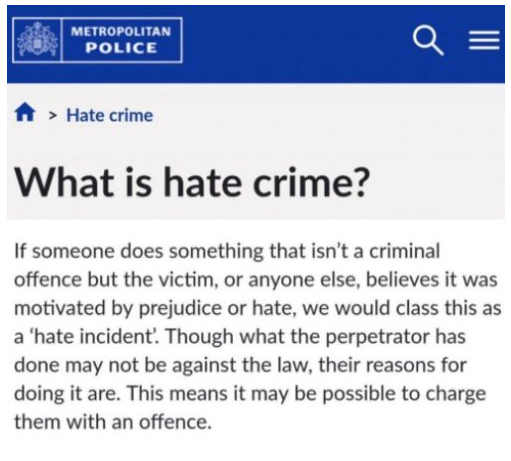 A ‘hate incident’ as the Met calls it is nothing more than fairy dust between a couple of apostrophes. It means nothing, so it means everything. They can arrest you for anything and the worst part is that they don’t even need a complaint or accusation. “Or anyone else” is the truly sinister part. Because the anyone else could be the police themselves. Though what the perpetrator has done may not be against the law, their reasons for doing it are. The UK police are now claiming the ability to be able to read minds. Seeing as they’re in the process of getting rid of all the men in that organisation, perhaps this is somewhat accurate. This means it may be possible to charge them with an offense. And hand them a criminal record. The objective of this strategy is a concerted effort at getting the public to ‘SHUT UP!’ You are no longer allowed to criticise your betters. Under this directive the police will be able to arrest people without cause; it’s as simple as that. The UK police have gone from upholding the law to making up the law to suit their political agenda. In case any of you have forgotten, Western democracy is intended to work in the following manner: we elect members of our community to represent us in parliament; these people write the laws and regulation that govern our communities; if we don’t like the job they’re doing we throw them out and elect other representatives; rinse and repeat. But nowhere in that process is there an addendum for the local constabulary to make up pretend fantasy laws outside this process. But that is what the UK police are attempting to do. They are becoming a law onto themselves which means the UK is on the way to becoming a police state. The writing was on the wall years ago when the police began referring to the general population as their customers. Because once you start that process then the logical process is to try and get as many customers as you can. With this announcement the entire population of the UK are now potential customers of the police at the police’s pleasure. You don’t need game in marriage. I noted the first and the last. If someone does something that is not a criminal offence, it may be possible to charge them with an offence. Show me the man and I’ll show you the crime. I often wonder how many times the arresting officers would have to open the door to a man holding a shotgun before they decide these “crimes” didn’t have sufficient priority to follow up. I make a point of watching this video at least once a year. It comes from the Regent University School of Law. It explains clearly why you should never talk to the police. About anything. Ever. I do suggest watching it.